This is the fifth article of our Living Tabernacles series, where we study the Tabernacle in depth. It is exciting to see how each element symbolizes some characteristic of Yeshua. It is also more challenging when we examine what each element means for us, since each of us is now a living tabernacle of YHVH. We are posting two articles each month as part of this series. 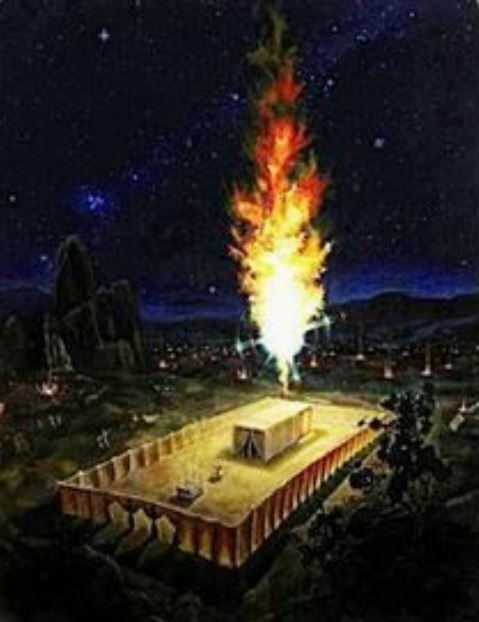 We have examined each element on YHVH’s list for building the Tabernacle. Now it is time to begin construction. The first thing YHVH gave designs for was the Ark of the Covenant. However, it was not the first to be constructed. The coverings and framework for the outer walls of the Tabernacle were constructed first. The coverings had to be in place before the Ark of the Covenant or other precious items could be constructed and properly protected. This is similar to creation. First, YHVH created the universe, then He prepared the earth with a balance of land and water, plants and animals, and finally people. We see a similar theme in the construction of the Tabernacle. First the outer coverings were made (the universe). Next the Tabernacle itself was prepared (preparation of the earth) and finally the people were invited in. After the Tabernacle was ready special attire was made for the priests who were the only ones allowed in the Tabernacle. At this point, we still have separation between YHVH and people due to the fall of Adam and Eve. As mentioned before in our second article entitled “Material Reflections”, there is significance in each of the items chosen for the framework and covering of the Tabernacle. We will touch on these briefly here, but for a fuller explanation of each, please refer to “Material Reflections”. The linen curtains provided the necessary separation from YHVH, Who is Holy (set apart). The curtains were protected by other coverings, just as we through Yeshua are protected by many coverings. The linen curtains were embroidered with scarlet, blue and purple threads. Each of these colors has deep significance as explained in “Material Reflections”. Cherubim were embroidered on the linen curtains. Cherubim were assigned to protect the Garden of Eden after the expulsion of Adam and Eve (Gen 3:24). We will examine the Ark of the Covenant and the role of the Cherubim in the next article in this series. Goat hair and the skins of goats and rams also covered the Tabernacle. Two goats were chosen on Yom Kippur (Day of Covering). One goat was selected by YHVH to be sacrificed for the sins of the people and the other goat was set free after all the sins of the people had been transferred to it. Both goats represent Yeshua, who took on our sins, was sacrificed in our place, and who bore our sins away as far as the east is from the west. Yeshua is the sinless, perfect Lamb and through Him we are no longer goats, but righteous sheep. The linen curtains were fastened with gold clasps, signifying purity and royalty. The goat hair and goat and ram skins were fastened with bronze clasps, signifying our sin and judgment that were placed on Yeshua. Ten linen curtains were made and fastened together. Ten is the number of a minyan. Recall Abraham pleading for Sodom and YHVH said that if there were ten righteous men He would withhold His judgment. It has become Jewish tradition that in order to publicly pray, there must be a minyan (ten Torah observant Jews over the age of 13). Ten represents governmental rule, whether it be YHVH’s (Ten Commandments), man’s (minyan), or hasatan’s (ten toes and horns mentioned in Daniel and Revelation). There were eleven of the other curtains. Eleven is the number of disorder, chaos and judgment. In Genesis 11, people rebelled against YHVH and built the Tower of Babel. Jehoiakim, one of the last kings over Judah, ruled for 11 years (609 to 598 B.C.). After overcoming the city, King Nebuchadnezzar of Babylon appointed Zedekiah as a puppet ruler of Judea. Zedekiah, however, soon rebelled against his masters. His reign ended in 586 B.C., after only 11 years. The apostle John saw 11 things in connection with the final judgment (Revelation 20:12 – 14). Several men were gifted to construct the Tabernacle, but two are mentioned by name. Bezalel whose name means in the shadow (protection) of God and Oholiab whose name means father’s tent. Through the precious sacrifice of Yeshua and His covering, we are now invited into Father’s tent. There are no longer any barriers to keep us out unless we create them ourselves. Let us tear down any barriers we may have created and welcome the covering of Yeshua.